Quinton de Kock took the stats pages, tore them into shreds and went about setting his own standard in the 241-run chase at Newlands in Cape Town to set the stage for South Africa’s seven-wicket win in the series decider against Pakistan. He hammered 11 boundaries and three sixes en route his 58-ball 83. At a venue, where the records hadn’t been in favour of chasing sides in day-night encounters, South Africa decided to field in the all-important clash. Even as the total wasn’t daunting, Pakistan’s innings had given enough inddication that shot-making wasn’t going to be as easy. But de Kock had other plans. The ‘keeper-batsman began the charge against Usman Khan in the third over. A bit of luck aided his attempt as after smashing him for a boundary and a six, he decided to go for another big hit only to top edge it and get caught. 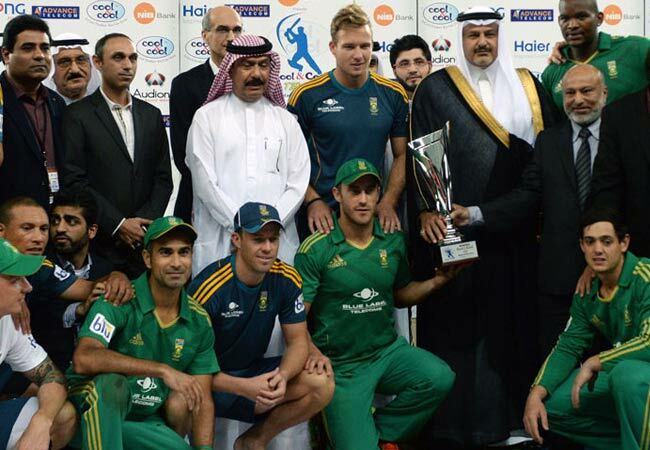 However, the bowler had overstepped and allowed de Kock a second crack at the chase. De Kock was only happy to cash in and went about stroking his 18th ODI fifty. South Africa were nearly flawless in their chase save a few untimely dismissals. Hashim Amla’s foot moved no where as he hung his bat to a delivery outside off and edged it to the ‘keeper. Reeza Hendricks, who looked in good touch, slashed at a short delivery outside off to give Shaheen Afridi a catch at third man. The big difference from Pakistan’s effort, however, was that South Africa scored at almost seven an over in the first powerplay, and by the time the second wicket fell, the hosts were left needing only 141 off 212 balls. De Kock and Faf du Plessis carried on the good work with another steady stand, yielding 46. The former had shifted up another gear during the course of this stand and looked well on his way to a century before he mistimed a slog, allowing substitute fielder Hasan Ali to take a fine catch running backwards. With three all-rounders and three lower order batsmen in the line-up, Pakistan at that point were in a space where they could have turned the momentum. All they needed was a few quick wickets. But they got none. Rassie van der Dussen and du Plessis carry forward South Africa’s charge with ease from thereon. None of the Pakistani bowlers managed to cause any sort of trouble, with Shadab Khan proving to be the most expensive – 0 for 78. Earlier in the day, Pakistan were restricted to 240 for 8. Having lost the wicket of the in-form opener Imam ul Haq early, the platform for their innings was laid by a half-century stand by Fakhar Zaman and Babar Azam. Azam was in sublime form and didn’t allow the South African bowlers to dominate despite an early strike. However, before Pakistan could take control of the contest, he was bowled in a bizarre fashion as he shuffled across his stumps oblivious to the straight line only to lose his leg stump. Zaman, who had got a life earlier in the innings, when his edge to Hashim Amla at slips was spilled, made good of the generosity and stroked his way to a rather controlled half-century. However, Andile Phehlukwayo and Pretorius kept picking crucial wickets in the middle overs, sharing two spoils each. Shoaib Malik, who was involved in a miscommunication with Shadab, was run out soon after to leave the visitors reeling at 174 for 6 in 39 overs. However, Imad Wasim’s cameo in the death overs – a 31-ball 47* – allowed Pakistan to post a fighting total. However, it proved too little to compete with South Africa’s clinical batting display. Brief Scores: Pakistan 240/8 in 50 overs (Fakhar Zaman 70, Imad Wasim 47*; Andile Phehlukwayo 2-42, Dwaine Pretorius 2-46) lost to South Africa 241/3 in 40 overs (Quinton de Kock 83, Faf du Plessis 50*, Rassie van der Dussen 50*; Shaheen Afridi 1 -34) by 7 wickets.